Is this a bug report? Can you also reproduce the problem with npm 4.x? Which terms did you search for in User Guide? 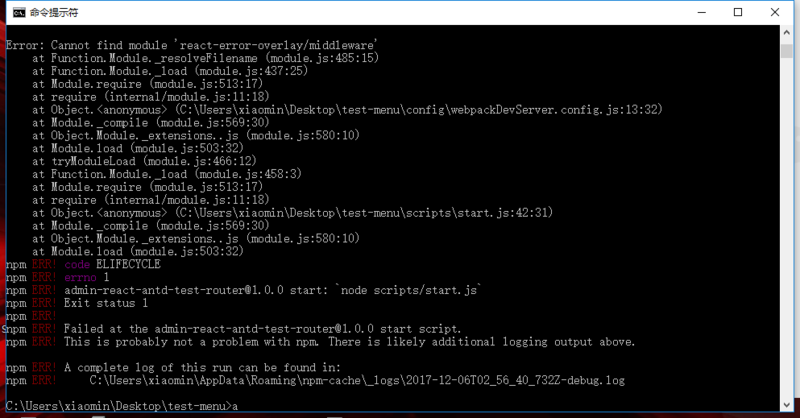 Note: Downgrading to react-scripts 1.0.11 works great. @gaearon That does fix the issue. But yarn upgrade react-scripts should have worked fine right? Also ran into this issue. Yarn install, then Yarn Start to launch Development Server. I have the same environment as the author and same error message. Deleted the node_modules and the yarn.lock file. Yarn install, yarn start. Works perfectly now. It's not working because the filename casing is different but OS probably didn't recognize that. I think we can fix it. @gaearon you mean by renaming the file to old name? The issue is because we replaced overlay.js with Overlay.js, and FS gets confused. Let's just completely rename this file to something else. e.g. ErrorOverlay.js. This should be fixed in 1.0.13. Please verify. I just upgraded to 1.0.13 and got this error when I copied and pasted yarn add --exact react-scripts@1.0.13 from the release notes. I went back and ran yarn upgrade react-scripts and it fixed the issue. Yes, you'll still have the issue if you even try to upgrade to 12. That's why we recommend skipping it and going directly to 13. But in any case removing node_modules and reinstalling will fix it. @balazsorban44 If you look closely at your error message, it is not the error message discussed in this thread. Please search issues for it—somebody already filed another issue about it. If you see this message it means you updated react-error-overlay to incompatible major version. Did you do this intentionally? It is expected that if you update packages to major versions, they will have breaking changes. Please don't update them if you haven't checked what changed. After upgrading to react@16.0 this issue arises to me as well. npm ERR! Failed at the admin-panel@0.1.0 start script. I had errors with react-error-overlay/middleware, I had upgraded them which caused errors. My fix was to downgrade. I've tried deleting node_modules and clearing npm cache without any luck. Doing some research around that error (like this one) it looks like there might still be a 16 incompatibility with that module, but the package itself should support it just fine. After I re-create the whole scripts is OK.